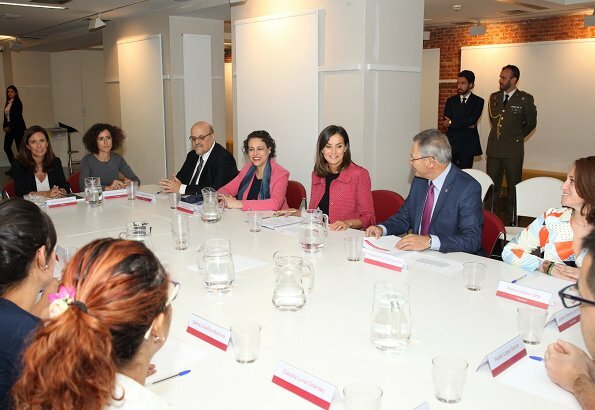 On October 4, 2018, Queen Letizia of Spain attended "Initiatives for Training and Employment for young people" (Iniciativas de Formación y Empleo para jóvenes) dialogue meeting held by Espacio Pozas 14 at the headquarters of Spanish Red Cross. 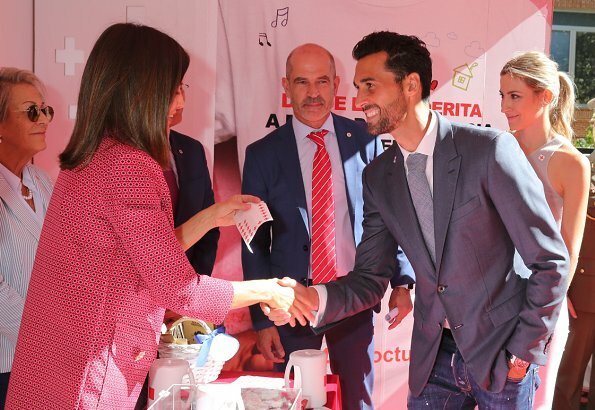 Espacio Pozas 14 is a community center of Madrid Red Cross and it is an educational, cultural and communal platform. 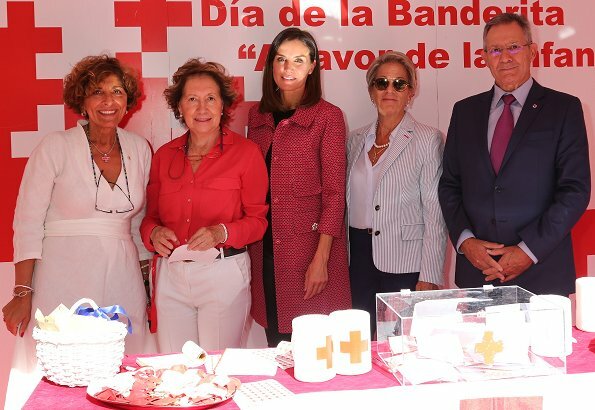 After the meeting, the Queen chaired Banderita (Little Flag Day) table at the headquarters of Cruz Roja Española in Madrid. Awesome Letizia! This is the chic, cutting edge, but still classy Queen that many of us like so much. Very lovely coat, don't care for the Leggings. It seems that she is the only one who can pull this off. Great event BTW. Not a fan of the skinny jeans/leggings but the coat is amazing. Love it. Letizia looks superb. 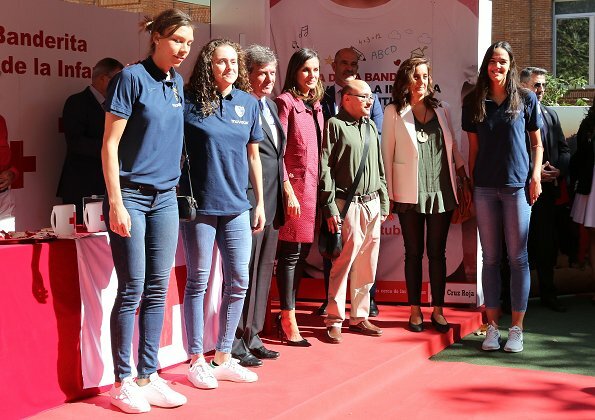 It's disappointing that Queen Letizia, usually beautifully dressed, still opts for the embarrassing sprayed-on pants look at times. Not a good choice, no matter how thin the wearer. The attractive long jacket, while a good idea, unfortunately does not do as effective a job as perhaps was intended. I agree, not classy at all for a queen. Great coat but she ruined the look with the pants. Another fabulous look from Letizia where she strikes the right balance between smart for the meetings and more dressed down for the less formal parts. I love that coat. Tanto el abrigo como los leggins, parecen de mediocre calidad, en cuanto a tejido y diseño. Siempre puedes tú pagarle un Valentino, yo desde luego no estoy dispuesta, ni la mayor parte del país. No es necesario un Valentino, faltaría más. Anonymous @ 9:53, I doubt that the pants and coat are of " mediocre" quality as you put it, I imagine that they are a little bit above average, that being said, I think that for this type of event it would be ridiculous to wear a Chanel o Versace..... She looks fantastic, modern, appropriate and chic with a repeated outfit. way to go Queen Letizia!! Well said Cherry Blossom, completely agree! And so do I. Thumbs up. And so do I!. Thumbs up! I love Letezia's outfit. Her coat is perfect with the leggings. I love seeing her in the leggings because she has not settled into a dated look because of her age or position. I hope she can be a trendsetter for other monarchys. Za mag bij deze outfit wel eens lagere schoenen dragen, voor haar gemak. 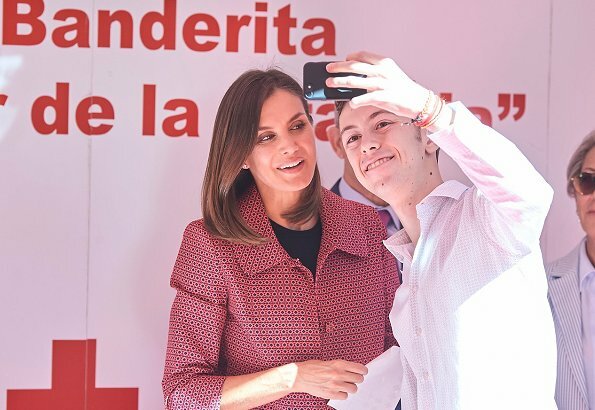 Letizia se ve fantástica, moderna y atractiva. 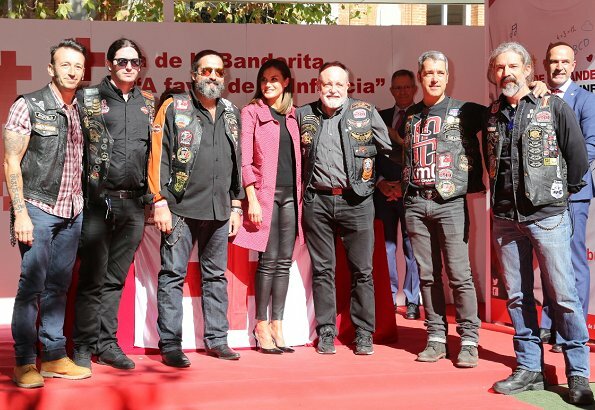 La combinación de pantalón y jersey negros con el abrigo fucsia resulta genial. Don´t like this combo, jacket looks somehow stuffy and those pants are horrible. Well Blondiini I like the pants, they are trendy and she has the morphology to wear skinny pants.